Our african drum ensemble includes djembes, doun douns, bass drums, congas and other percussion. 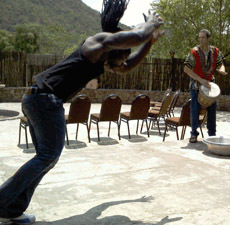 Live drumming performances are vibrant and energetic, and can include african dancers and acrobats. As well as fire dancers, for spectacular visual displays. Our drumming performances can be combined with interactive drumming, where we teach the audience to play along and participate in the performance. Traditional Cuban drumming includes bongos, congas, timbales, shekere, bells and other percussion. Feel the pulsating rhythms of Cuba. contact us for any special requests for drummers of a certain genre; session drummers; Marimba bands; Jazz bands and more. Contact us for a drumming performance quotation or for any enquiries. 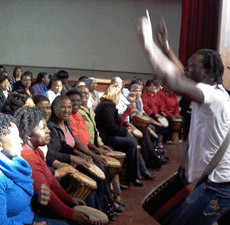 drum circles, interactive drumming and live performances in Cape Town, Johannesburg and Durban, South Africa. Djembes for sale. Handmade congas, bongos, bata and more. Custom handmade drums for Professional players. Afro-cuban drums and percussion instruments made in SA. African drumming, Afro-cuban drumming, team building drumming sessions, drumming parties and workshops. Experience live music! African drumming resource, learn more about drums. Drum sales, djembes for sale, djembe repair, drum refurbishing and repairs, drumming tips, and more..